Ostapenko looked in a hurry in her first round match, overpowering Zarina Diyas in a 6-1 6-3 victory. Ostapenko then scored two upset wins, beating Svetlana Kuznetsova, 7-6(5) 6-0 and Petra Kvitova, 5-7 6-2 6-1. In an unlikely Premier 5 quarter-final against Saisai Zheng, Ostapenko recovered from a break down in the first set (having originally led 3-0!) to progress in straight sets, 6-4 6-3. The overwhelming takeaway from the chunks of the match I watched were Ostapenko’s court position, up on the baseline and dictating play. This court seems to suit her game and she’s able to hit through her opponents. It’s hard not to smile at Petkovic’s super turnaround in 2016. Just a few months ago she was contemplating her future in tennis but with time for physical and mental scars to heal, the German player has looked refreshed and is playing with freedom. Petkovic played arguably her best match since Madrid last year (d. Pennetta, 6-3 7-5 in R1) with a 6-1 5-7 6-2 victory over the number four seed, Garbiñe Muguruza. Petkovic’s level was super high in the third set and she barely put a foot wrong. On the other hand, Muguruza looked frazzled after a really frosty changeover with her coach, Sam Sumyk. She put her visor down on the next changeover, clearly emotional. Back to the beginning of the match; after the Spaniard lost a quick first set and went off the court for a medical time-out, coming back with a taped up thigh, she got stuck in and played a really committed second set. Muguruza saved four break points in a five deuce game at 1-1 and then broke in the next game. Petkovic played a blinding service game at 2-5 which gave her the momentum to fight back to 5-5. Petkovic was up *40-0 at 5-6 but a double fault gave Muguruza something to work with as she stepped up her aggression to break and force a decider. It’s worth noting that this was a super match. In fact, despite Doha’s wild streak of upsets, there have been plenty of decent matches this week and i’ve got a growing list of ones that I want to catch up with! Muguruza did well to hang onto her service game in the first game of the third set, saving five break points, but it was all Petkovic from then on. I loved her post-match interview where she was asked about whether her intelligence helps her on court to which she responded no, because she has no instinct whatsoever! Head-to-head record: This will be a first career match-up between Petkovic and Ostapenko. Interesting stats: Petkovic’s win over Muguruza was her first top five win since beating Victoria Azarenka in Beijing back in 2013. She’s also into her first semi-final since Charleston last year. Ostapenko made the semi-finals in Quebec City last year where she happened to beat none other than Naomi Broady to make the final. However, this will be her the first Premier semi-final of her career. Andrea Petkovic, d. Garbiñe Muguruza 61 57 62 to make 1st Premier SF since Charleston. 1st Top 5 win since 2013 Beijing (Azarenka). 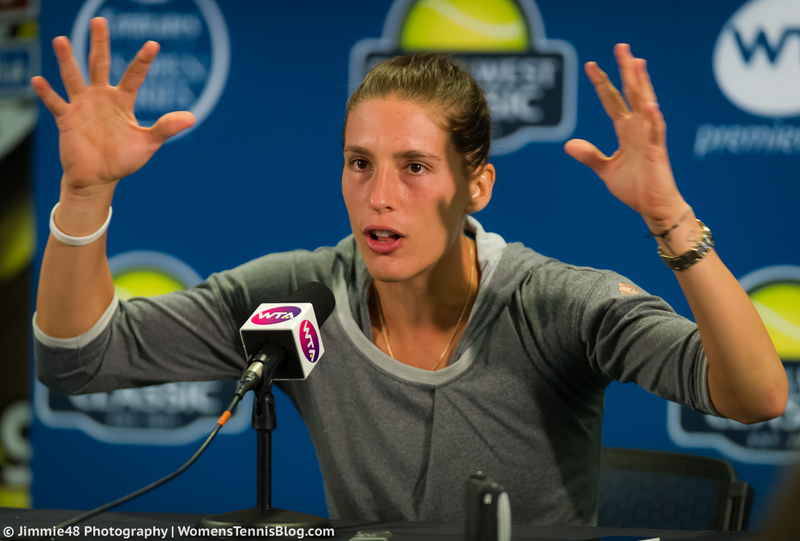 Analysis: I was pretty bowled over by Petkovic’s performance against Muguruza but then again, I felt the same way about how Muguruza played against Babos on Wednesday and she was unable to replicate it in the quarters. Petkovic is definitely the favourite with how consistent she has played the WTA tournaments this year but Ostapenko represents a significant threat. She’s taken out two seeds with a couple of emphatic sets and won’t be afraid to go for her shots. The concern about Ostapenko is that she has had some shaky losses and can go careering off the tracks; twice this year she has lost from match point up although she seems to have steadied the ship in Doha. I think this could be a very competitive match and i’d go with Petkovic to come through in three sets. February 25, 2016 in Doha, Ostapenko, Petkovic, WTA. ← WTA Doha: Hooray for the hotshots, Radwanska-Vinci was fabulous! Suarez or Ostapenko please win this tournament. We need new faces. However, I know Aga will win this tournament. Period. Lol I am curious as to what you mean by period? Vulture period? Haha! It will be a Petkovic v Radwanska final,thats my predication,though nothing surprises me at the moment in the WTA! I don’t like when Serena and Maria doesn’t play in tournaments top seeds play horrible. The seats be empty and lackluster. The WTA is lacking star power and young hungry players. When Serena and Maria leaves a lot of fans will follow. I remember when Serena play in Doha fans had signs up. Petkovic isn’t playing great by any means and Jelena isn’t playing great either. Toss up 50/50 anybody game. I didnt watch Aga yesterday but what an awful match it was today from her and I am also surprised that CSN kept her level the whole match, she plays awesome tennis in Doha. What was Radwanska doing?Sleeping….I have to take loss when she was broken for the second time in first set …had i waited for miracle to happen which never happens i would have doomed for the day. We have a CSN v Ostapenko final,this young Lativan girl is very promising.